Yeah, the title of this blog is a bit vague or let’s say multi-subjected, but maybe it grabs attention. It’ll all make sense soon enough. Or not. There are exciting things going on around here this month and so what better way to kick it off then with a quick review of one of this season’s top jerseys. This team has scored a ton of goals this season thus far and is looking better than anyone in Europe. 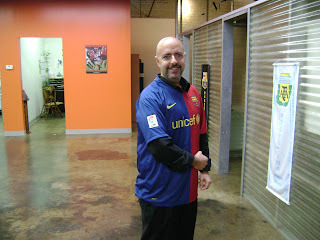 If you’re thinking it’s FC Barcelona then you’d be spot on! No doubt part of their stunning success this season is due in part to the cool jersey they’re wearing. The design with the two halves blue and red is a throwback to the shirts worn in 1899 and 1999 (when they won a league title in their centenary season). So, maybe it’ll bring Barça some good luck, and it’s looking pretty good at the Camp Nou right now. 10 years after … The historic Barça shirt features a velvety team badge embroidered on the heart, Nike logo on right, LFP badge on right sleeve, and UNICEF logo on center chest. As far as the fabric goes, this one brings more than the usual mesh. It does include the Dri-FIT moisture control and wicking weave, yet it’s a double layer of it which will not only keep you fresh throughout the match but it will be more durable than other jerseys out there. Plus at $55.99 it’s an awesome deal, especially as a holiday gift. 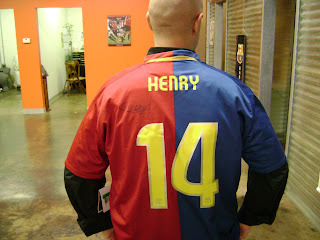 You can sign up to get the signed Thierry Henry jersey I’m wearing, here. As far as that thing above my lip, there’s a very good reason for it. Check this out: a few of the men folk at our fine establishment have sacrificed all sense of civility and gone mustachioed since the 1st of November or MOvember, some with more to show than others. But it’s all for a good cause, prostate cancer; though sad to say our growths have yet to spur any significant contributions to this most worthy of causes, though we shall remain ever hopeful … and hairy. All the hopeful and the hairy will be celebrating the 10th anniversary of our outstanding company - 365 Incorporated www.365-inc.com. We shall be toasting, many times we hope, to our esteemed founder, Bernard Frei, and all the hard work he’s put into getting us all to where we are today. Though, as I’m sure he’ll tell us, we’ve got a long way to go, as being 10 we haven’t even hit puberty yet. We hope to take a few snapshots of our revelry later on.